This pair of wooden spirit masks were carved in the Middle Sepik River area of Papua, New Guinea and are referred to as Sepik masks. The men of the tribe carve them of soft woods, then apply decorations with natural pigments and charcoal in ochre and black. The heavily outlined slanted eyes, each covered with a cowry shell, do not have holes to see through. Masks such as these represent the spirits of ancestors and are not meant to be worn on the face. 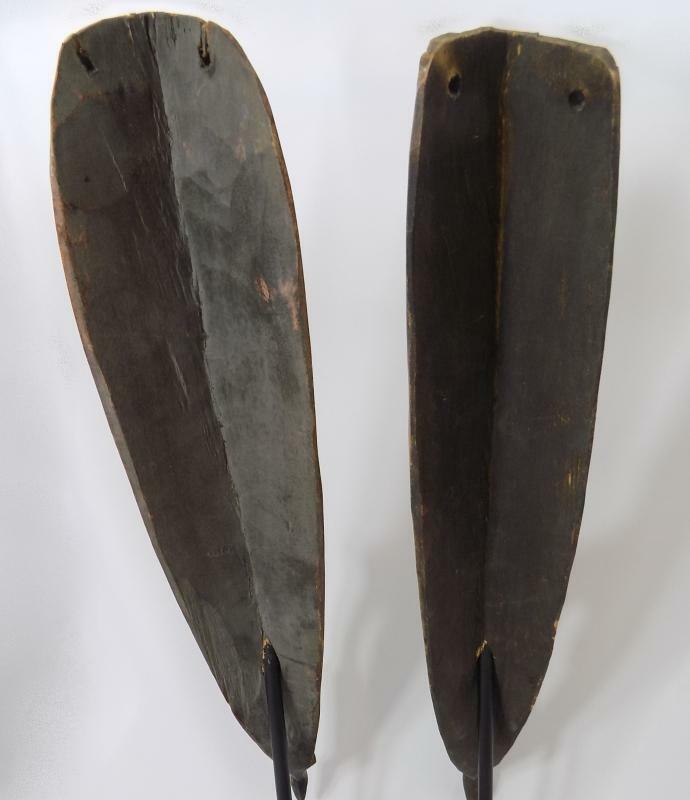 They are hung on the interior and exterior walls of the men's longhouse where ceremonies to please the spirits are performed and boys are initiated to become men. The masks are displayed to ward off evil spirits and to attract powerful ones. Both masks have pierced septums and arched, elongated noses which reach down to their chins. Their pigmented designs are intricate and beautifully drawn. 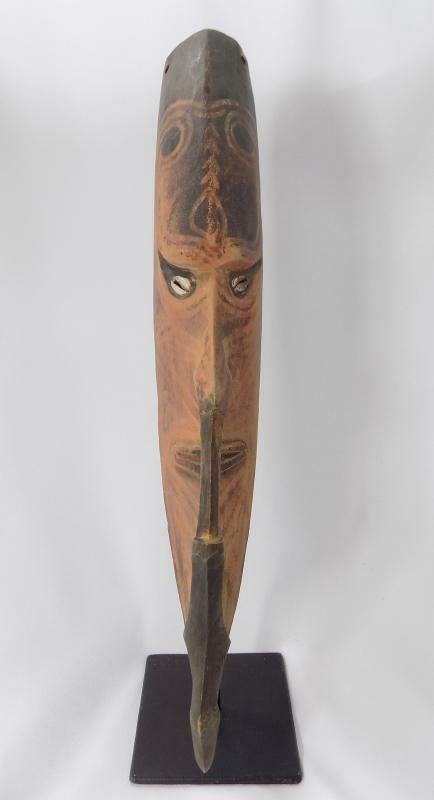 It is easy to see why the Surrealist artists of the 1920's were so strongly impressed by the indigenous art of Nouvelle-Guinee and how it influenced much of the avant-garde art of the time. 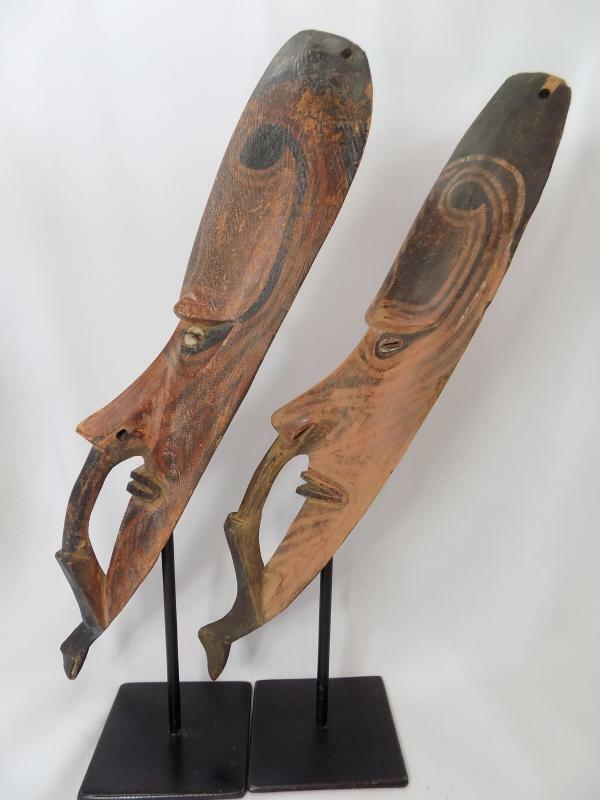 These masks, we think, were probably made in the second half of the 20th century. 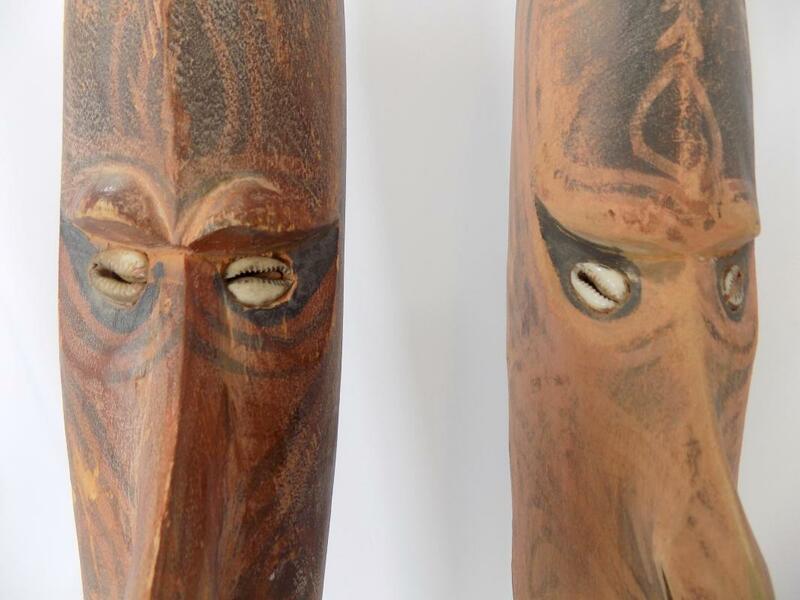 When masks are damaged or no longer usable, they are discarded and new ones carved. Moisture and insects also take their toll, so the masks that survive are ones that were collected or purchased soon after they were made. 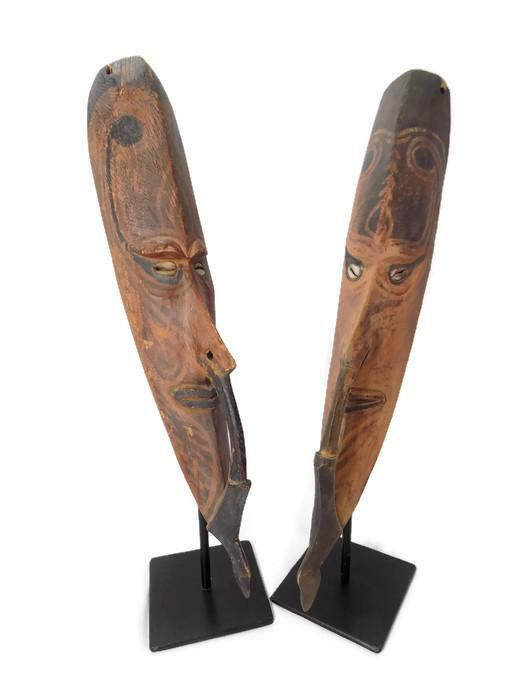 Papua New Guinea has over 1000 indigenous ethnic groups, many of which sell or trade their arts. The masks differ a bit in size; the slightly larger one measures 18 1/2 inches tall and weighs 1 pound 12 ounces, while the smaller one is 17 inches tall and weighs 1 pound 10 ounces. 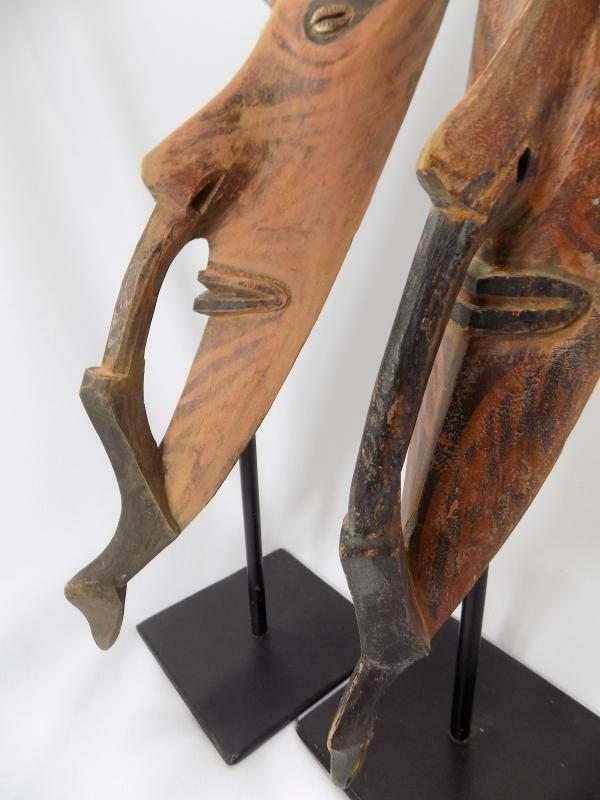 Each has a pair of holes for hanging that pierces the upper edge; one hole on the smaller mask has a chip out of the wood above it and there are a few minor nicks and chips to the wood on both, but they are in excellent overall condition. 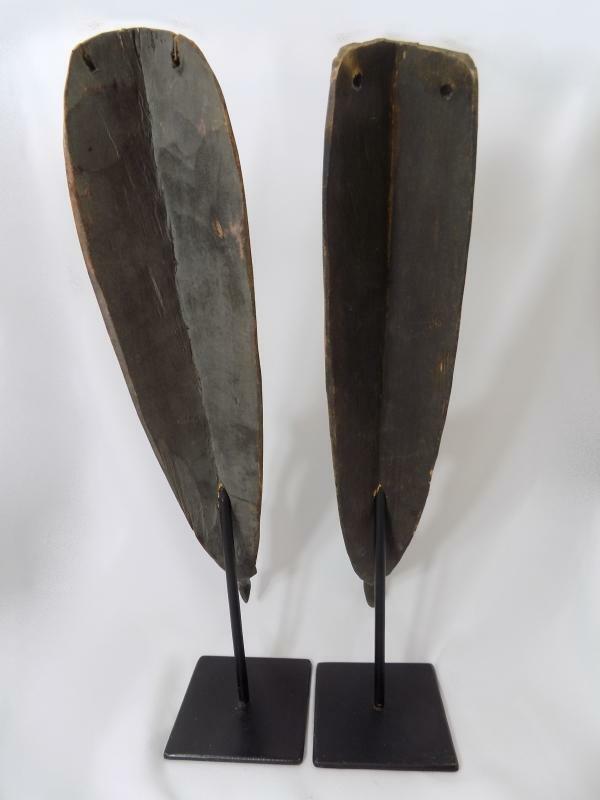 They are mounted on identical custom metal stands, 4 inches square and painted black. Both masks are intact and unbroken, with the painted motifs still strongly colored. A talented tribesman took great care to carve and decorate these handsome masks to honor his ancestors and they have been well preserved ever since.